There are so many situations, details and peculiarities that seem completely strange at keno. Curious players have been wondering about these weird things for decades but most of them actually never got the right answer. In the below article, we have decided to take care of those hag-ridden gamblers and tried to find the solutions to these enigmas that drive us up the pole! Is it true that attempting to bet on a 10/10 is useless at keno? Yes, it is because 10/10 is so uncommon! But uncommon doesn't mean that trying it is forbidden. At any rate, if you came to win thanks to this combination, you'll no longer have to ask yourself thousands of questions about it! So take your best shot give it all you got! Lots of people try out 4/4 keno cards. They say earnings are smaller but more frequent. How can it be? 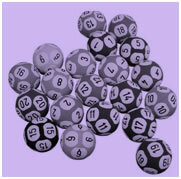 Indeed, some players are used to buy about twenty keno cards with four numbers each at the beginning of the draws. We think that this strategy is inefficient on the long run because one day or another, they will end up losing the small gains that they succeeded in amassing by chance. Yet, this strategy could work in a short-term configuration. The 6/6 keno cards are definitely the players favorite. But why? After all, they never win using these cards! Most of players choose 6/6 cards because they blindly trust the mathematical calculations on odds. They say that the likelihood to win using a 6/6 card is one out of 3383, which still represents a lot more than the odds associated with a 7/7 card. By mean of comparison, the probabilities to win with such cards are only one out of 15464! The only thing that they do not tell you is that if you decide to play at random, you could fairly earn money only once out of 3833 times. Admittedly, this means that when playing a bit more smartly than average, these figures wouldn't even be worth a dime! According to your own experience, which card seems the most profitable? To us, the one card all players should choose is the 7/7 provided you can use it adequately thanks to a good strategy. Why are the draws broadcast live through two different videos? We have learnt that the presenter does not have access to the wheel room due to security reasons. What tells us that the video showing the wheel was not recorded? Yes, it is possible but what could be the use of it? Before each draw, the location of the numbers on the wheel is usually shifted in order to warranty the game's randomness. But this modification is announced only at the end of the game. What is the logic of doing that? You are right. There is no need to know the exact locations to win even though being aware of this fact before the game would have allow players to use a software and probably score higher. This may be the reason why they communicate the information after the game.